The Bridge to Nowhere is an easy reach from your accommodation at Alexander Spa Motel, The Bridge to Nowhere provides for a full range of activities from sightseeing to bush and trail-walks, cycling canoeing, kayaking and even jet boating. 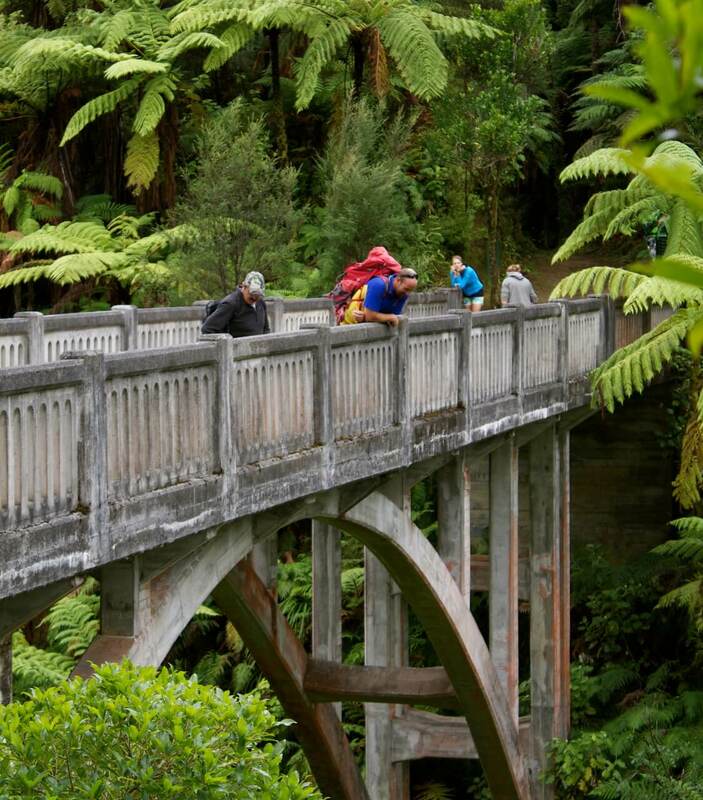 The Bridge is located in a scenic setting in Whanganui National Park. It is a concrete road bridge spanning the Mangapurua Stream in Whanganui National Park, North Island, New Zealand. It has no roads leading to it, but it is a popular tourist attraction, accessible by mountain bike or tramping on a variety of different tracks, or by boat or kayak, followed by a 45-minute (one way) walk along maintained bush trails. Started in January 1935 and completed in June 1936, the bridge is 130 feet long and 125 feet above the stream. The bridge was built to facilitate vehicular access to the Whanganui River, to link the settlers of the valley with the riverboat service. Virgin forest was cleared, and a total of 35 holdings developed. A school was opened, and for some years the valley prospered. However economic hardship, and problems associated with the remoteness and difficulty of access, resulted in many families abandoning their farms. By 1942 there were only 3 families left and the settlement was officially closed in May 1942. The disappearing road line, old fence lines, stands of exotic trees, occasional brick chimneys, and this bridge serve as reminders of the ill-fated settlement of the Mangapurua Valley. If you are planning a trip to The Bridge to Nowhere then Alexander Spa Motel is an ideal place to stay.